Place the tenderloin in a plastic container with a sealing lid. Add the apple juice, soy sauce and sugar. Let marinate in the container with the lid on it and refrigerate for at least 30 minutes before cooking. When the 30 minutes are up, remove the tenderloin from the fridge. Move the pork into a baking dish and cover in olive oil, sprinkle with seasoning and black pepper. Add the marinade to the bottom of the container, cover with aluminum foil and cook in the oven at 375°F for 20 minutes. Uncover and let the pork brown for an additional 10 minutes. The pork will be cooked when it reaches and internal temperature of 145°F. Remove from the oven and let the meat sit before cutting to seal the juices. Place the apple slices on the grill or to a grill pan and grill on both sides until they caramelize to your liking. To serve, cut the tenderloin into slides and decorate with apple slices and rosemary sprigs. You can marinate the pork overnight and keep it refrigerated. You can use red delicious apples or Granny Smith apples. Pork tenderloin recipes are great to have, especially when the holiday season arrives and family reunions are being planned. I love preparing pork tenderloins because they're easy to make, juicy and tender. 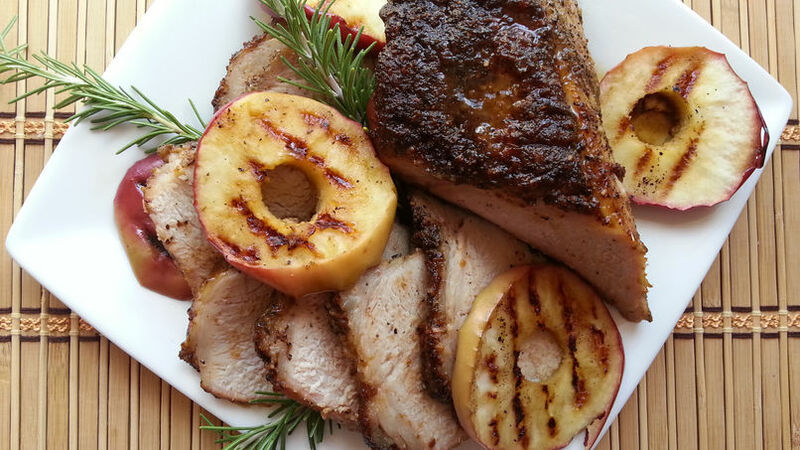 This time I'm sharing a recipe for pork tenderloin marinated in apple juices and spices and served with grilled apples. I invite you to try this simple recipe!